The recycling model in the United States is fundamentally broken, and while many factors contribute to this issue, the net effects are that the economics of the business are in the trash. On this, America Recycles Day, let’s look at the costs involved in those factors and what changes must be made to ensure the local recycling programs, which consumers know and love, are sustainable for generations to come. There are three critical elements that must be understood if we are to accept the recycling business model. Collection. The costs associated with running a collection operation include picking up material at the curb, transporting it to a processing facility, and tipping it on the floor. This involves capital, labor, ongoing safety training, maintenance, fuel, and other associated costs to provide a reliable collection service for residential and commercial customers. Processing. Local sorting and processing facilities operate close to 24 hours a day in some markets. These facilities are where material collected from recycling containers is sorted and bundled into unique bales of commodity that are ready for transport to and sale at market. Now more than ever, these operations rely on labor and technology to separate contaminated material and residual from the stream. Simply put, people and machinery are pulling out material that should have been placed by consumers in their waste containers, to begin with, because it is dirty, wet, or does not possess a commodity value at market (think toys, clothing, or yard waste). Value of Material. The costs associated with the sale of recyclable commodities at the open market are offset by the negative value of collection and processing of contaminated material and residual. In the early days of recycling (the late 1980s), the price paid per household was artificially low. Why? Because local governments (and others) wanted residents to adopt the new service. The national average price per home was around $2.00 per month for weekly collection. The actual cost to run the collection operation, however, was around $5.00 per month, so the collection operation was upside down. So consumers paid very little for the service, commodity markets were paying top dollar for the commodity, and recycling programs were profitable. It was a win/win for everyone. Fast forward to the present day. The national picture looks dramatically different. The average price per home for collection has not grown much and sits around $3.00 per month. But anyone with a car knows how much transportation costs have risen since the late 1980s. The cost of simply getting a collection truck to an average household today is up to about $7.00. That means the collection model is even more upside down for operators than it was in the past. On top of that, the costs to operate processing centers have almost doubled to more than $100/ton. This is due to the need for more sophisticated sorting equipment and the growing problem of adding labor to sort through increased contamination in the material stream. Last but not least, the value from the commodities at market has dropped to an average value of $100/ton. This large drop in value is attributed to market disruptions from China’s exit from the recycling market (known as China Sword) and is further impacted by higher levels of contamination in the recycle stream, which require separate transportation and disposal. 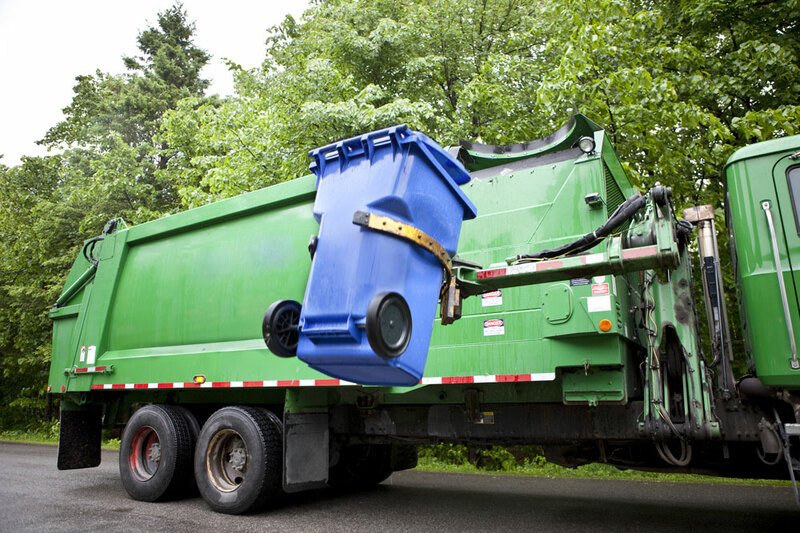 Now, on any given day, more than one-third of every recycling truck that serves your home is not recyclable and eventually becomes trash. 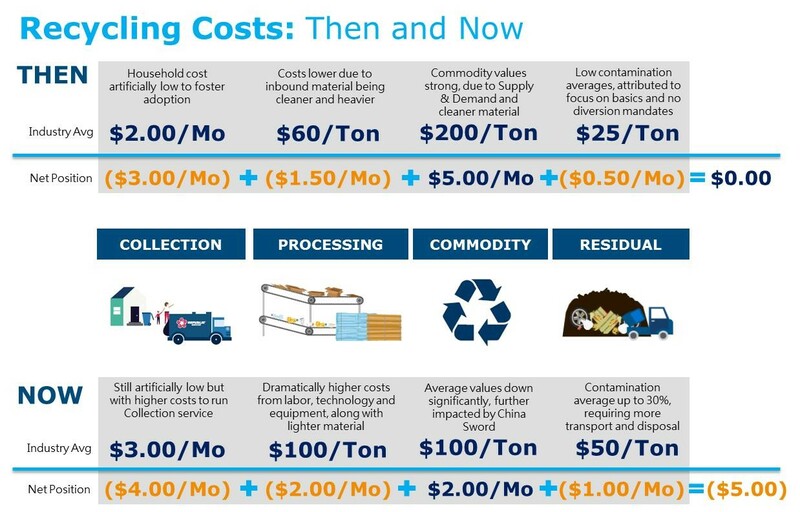 It comes down to basic math: The costs to collect and process recyclables today are no longer covered by the average value of the commodities sold at market. This means that programs are upside down. By how much? On average, just over $1.00 per week per home, or about $5.00 per month since weekly collection runs 4.3 times per month. First, reset the economics of recycling contracts. 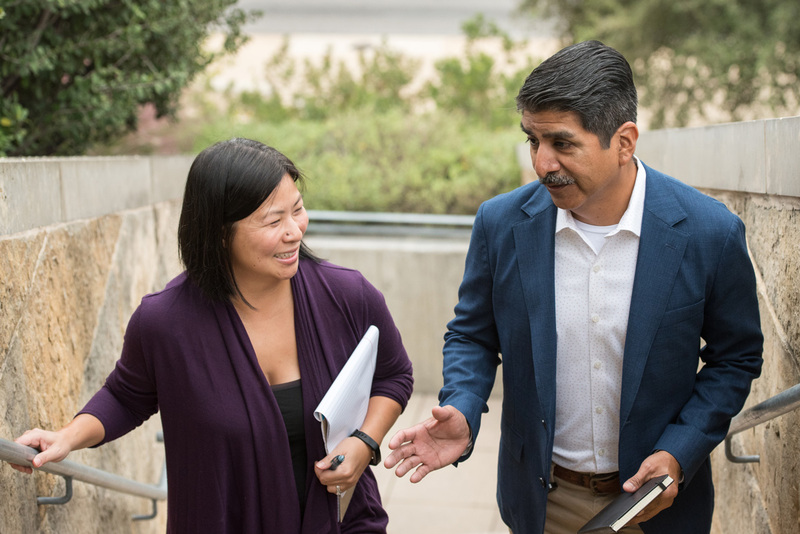 Contracts must ensure service providers are paid for the collection and processing of what residents are putting in their recycling containers, which means that the average price to a homeowner would increase approximately $1 a week. Contracts are shifting so that local governments can enjoy revenue from the sale of commodities, either to be used to offset rates or used in the general fund. Second, implement robust and durable public education programs. By educating the public on what to recycle, and how to recycle properly, contamination rates will decrease, lowering the average processing costs and thus the price to the homeowner. We know people want to do their part to sustain the environment, but many are confused about how and what to recycle today. Decreased contamination will result in increased value for high-quality commodities, yielding more revenue back to communities. Would you be willing to pay $1 per week to save recycling in your community? Republic Services, Inc., an ICMA Strategic Partner, provides nonhazardous solid waste and recycling services for commercial, industrial, municipal, and residential customers. Republic Services and ICMA are offering a free webinar on December 4. Register today! This infographic lists 10 myths about the costs and benefits of recycling. New residents request curbside trash and recycling services.